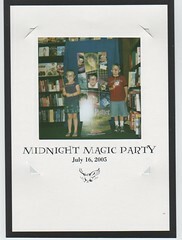 Friday night we did the bookstore circuit and the kids got all the freebees around the new Harry Potter book. The funny thing is, we didn't buy a book that night, rather we waited until this morning. The stores were smart enough to have tons of copies still available. While we were in line I actually saw a couple of people add the book to their checkout pile when it was offered by the clerk. That's the way to up-sell stuff, "Would you like the new Harry Potter book that that today?"